Are you looking for a great numbering machine to speed up production? The Count Auto Pro Plus II is the machine for you! This machine is known for its heavy duty machinery and its high quality. With the Auto Pro Plus II, you can quickly number, perforate and score documents with the touch of a button. This machine is capable of numbering up to twenty impressions per sheet and is capable of accepting paper up to 18″ x 20″. This machine is designed with a small footprint measuring 47″ D x 17″ H x 27″ W making it convenient to fit on any table or countertop. It also has bottom friction feed wheel allows the user to continually add paper while the machine is running. The Auto Pro Plus II is ideal for businesses offering a wide variety of services that require automatic feeding features. This machine is designed to produce high-quality numbering, perforating, and scoring tasks up to 19” wide. The Auto Pro Plus II can number consecutive, duplicate, triplicate, four times, six times, or repeat action up to three drop-away zeros for each project. It features a user friendly menu driven microprocessor controller which guides you through set-ups for your papers step-by-step. The self-fanning automatic bottom feeder has been engineered for continuous loading without stopping, for maximum production. Since the Count Auto Pro Plus II is a bottom fed numbering machine, any job that has to be run back through the machine a second time will maintain the proper number sequence. The feed rails offer micro-lateral adjustment to keep the alignment of paper for a straight perforation and score every time. The caliper paper adjustment is easily set to feed single sheets or multiple-part carbonless paper, even on the open edge. The Auto Pro Plus I Numbering System consists of one head and offers 20 strike locations! Since the Auto Pro Plus II Automatic Numbering Machine can number nearly anywhere on a sheet, its perfect for tickets, sheets, invoices, inventory tags, and so much more! If you have any questions or are interested in the Auto Pro Plus II Automatic Numberer, visit us at SpiralBinding.com. 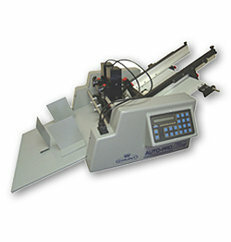 We have great pricing on a full line of Scoring and Perforating Machines. Call us at 1-800-631-3572 for more information!